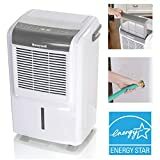 Honeywell - DH70W : Dehumidifier Review • The Air Geeks, reviews of air conditioners, dehumidifiers and air purifiers. Ease-of-use, efficiency and affordable pricing. On paper, the DH70W is a powerful dehumidifier that is designed to remove up to 70 pints of water from the air per day and is optimized to suit your needs, as you should not let excess moisture ruin the environment of your room or damage your valuables. Put to the test, the DH70W is durable and intuitive, although it lets out more hot air than its competitors in the same segment, which is not ideal in the summer. However, if you are looking for a suitable humidity control system for your medium or large house, then you should consider the DH70W : as we shall see, it is engineered to enable you to breathe easily and comfortably, with only minor imperfections. Dehumidifiers come in different designs and with different capacities to meet the diverse requirements of users. High capacity units are suitable for medium and large rooms while low capacity units are optimized for relatively small rooms. The DH70W is designed for medium and large rooms. Put to the test, this dehumidifier was efficient for a 2500-3000 square ft. space. The DH70W is designed to collect up to 70 pints of moisture from the air in a day. In real life conditions however, fear not : you will not have to empty its 14.4 pint tank 5 times a day. Indeed, the dehumidifier collects only ~35 pints of water from the air at room temperature, which can be drained continuously. On the plus side, this dehumidifier features a highly effective humidistat control system that automatically activates dehumidification by sensing the moisture level of a room. This digital subsystem helps the unit to maintain the set humidity level, and we have to say it is very accurate. What does that mean for you? Well, with this system in your house, you will be able to breathe and protect your household from excess moisture while leaving the unit on autopilot. The water collected by a dehumidifier is stored in a reservoir. This unit comes with a large tank that has a capacity of 14.4 pints. This system also offers a water level indicator that enables users to monitor the amount of water collected. Moreover, it offers a sound alert as well as a light indicator to notify you when the tank is full. In case you are not available to empty the tank as soon as the system has alerted you, the dehumidification is designed to stopautomatically. This prevents water spillage in your house. Well, the vast majority of us is not a fan of having to empty our tank every day, right? Fortunately, this unit allows you to use a standard garden hose to continuously drain the water collected. This option gives you flexibility and lets the unit run for longer periods without requiring your attention. Wheels that will help you carry it around! Sometimes you may need to move your dehumidifier from one part of your house to another. This can be a cumbersome exercise if the unit is not properly designed to allow you to do that. The DH70W features caster wheels that allow you to move it conveniently by pushing it from one position to another. Its side handles make it easy for you to hold it while moving it. The DH70W offers a 24-hour programmable timer and an auto restart feature. The timer allows you to set when the system goes on and off. Furthermore, the intuitive user interface of this unit allows you to adjust settings with ease. The LED display gives humidity level, temperature, and timer settings. In addition, this dehumidifier offers two fan speeds. The DH70W also includes a washable air filter (easy to wash, which is always a plus), and its noise level is of 50 dBA : a very acceptable level for a quality dehumidifier. This unit generates heat. Some users have complained that this unit blows out hot air that makes the house warmer. It can therefore increase the temperature by a few degrees if it is left running for long. Small imperfections in the details. Some users have complained that this unit leaks when it is connected to drain the collected water through a hose. So far this unit has worked excellently but I will only award 4 stars until it lives 3 years. Then I will update this review and award it the full five stars as these modern dehumidifiers seem to only last a few years at best. The good news is that it does have a 5-Year Limited Warranty so hopefully that will keep it alive that long. ;) To be upfront, these units are sold by the amount they can pull out of the air within 24 hours--not their tank size. That means this model can pull 70 pints of water out of the air within 24 hours but only if you hook it up to drain into a sink/drain or empty the 14.4 pint tank 5 times! So if you can't have this and other units drain automatically, look into tank size more than the speed at which it can take the water out of the air. Most people won't want to empty it five times a day. A faster model with the same tank size will just fill up quicker. During my tests this unit was quieter than other 70 pint models I have--Soleus Air, Whirlpool and GE and seemed to pull the water very quickly. It does not have a pump for the hose output--something that is needed if you are draining to a sink that is above where the unit sits. I hope this has helped you. I will update this as I discover issues or continue to love it. :)"
For the sake of comparison, I purchased a Frigidaire FAD704DWD Energy Star 70-pint Dehumidifier last year, which is near the top of last year's Consumer Reports list, and has been working beautifully. Although the MSRP of both units is similar, Amazon's selling price has about a $60 gap (at the time of this review), so I was curious to see if there was a big difference. To be honest, there's not a huge difference in terms of performance, overall design, or price. The Honeywell is every bit as quiet, and pulls about as much moisture from the air. My impression is that the discharged air from the Honeywell is slightly warmer than the Frigidaire, but not substantially so. Where the Honeywell shows improvement is in the ease of removing and washing the filter (which is really much more valuable than you might think, if you're keeping this in a utility room like I do). And, the display is much, much nicer. Where the Frigidaire shows you what the humidity level is set for, the Honeywell shows the setting and the actual humidity level. All things being equal, they're both excellent dehumidifiers. Whether or not the improved filter design or extended display is worth the premium, you'll have to decide for yourself. Either way, you can't go wrong." A work done well. 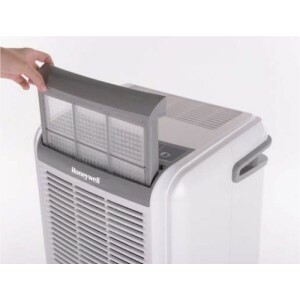 Honeywell specializes in appliances for the home and its 70-pt dehumidifier model is almost a home run. If you are looking for a strong dehumidifier for your medium or large house, then the DH70W is a good option for you. The fact that it generates some heat and can therefore cause the temperature to rise by a few degrees is the most major imperfections : it is up to you to see if it can cause you worries!